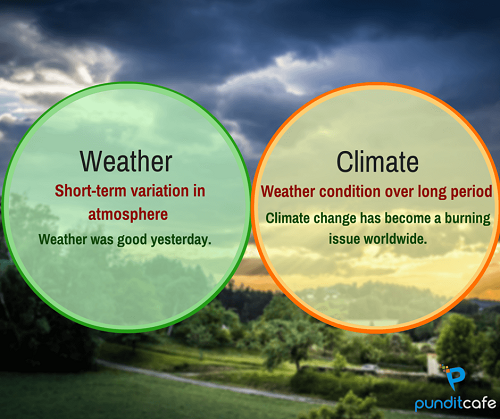 Weather and climate are conditions used to describe the general atmospheric terms of a particular region. Despite being different, weather and climate demonstrate a significant number of similarities. The term weather is used to describe the day-to-day state of the atmospheric conditions of a particular region. It is measured in short-term, which can be either minutes, days, or even weeks. Some of the aspects used to describe weather include the combinations of temperature, humidity, cloudiness, precipitation, and wind among others. The term climate is used to describe the prevailing weather conditions of a specific region, which has been measured for a long time. It is important to highlight that climate is the average weather of a particular part which is experienced for a more substantial period usually more than thirty days. Both weather and climate are categorized in the discipline of atmospheric sciences. This means that if one wants to study climate, he or she will have to consider weather first to understand what constitutes climate. Moreover, it is clear that the only difference between the two is that one weather portrays results likely to be experienced in a particular region for a shorter period while climate constitutes the average measurement of weather conditions of a specific part. Highly repeated weather condition constitutes the climatic condition of that place. It is clear that the weather and climatic conditions around the world are significantly different. This is a clear indication that both weather and climate do not follow a defined pattern but vary from one place to another and from time to time. The weather of a particular region can be cold in the morning and hot in the evening. On the other hand, a specific area can be described to be cold only for it to change after a certain period due to specific factors like deforestation, industrialization among others. Both weather and climate are similar such that they include identical atmospheric characteristics such as precipitation, temperature, humidity, wind, and pressure among others. This means that the factors that influence the weather or climate of a region are the same. What brings about the difference is that; when one measures the factors to determine the weather of a place are only done for a short time, which is not the same for the climate of a specific locality where these factors are measured for a long time before determining the climatic conditions of a particular region. Moreover, weather and climate are atmospheric conditions of a place measured at different times. Both weather and climate intersect in various regions while at the same time having a significant influence on one another. It is worth noting that it is one of the atmospheric conditions that determine what the other one will be. For example, a cold region with high level of humidity as its primary climate, the weather of the area will be described as cold or humid. This is a clear demonstration that climate influences the prevailing weather conditions of a specific period. Both weather and climate play a significant role in the natural environment because they influence the distribution of plants, animals, and settlement of people. One of the ways through which both climate and weather influence the behavior of animals is migration and mass movement of animals from one region to another. These factors influence where people live and what is their main economic activity, which is a clear manifestation of how weather and climate influence the life of human beings. However, the two may portray some difference in the way they influence our lives such that the weather will influence what we do for a short period while climate will influence what we will do for a long time. Weather and climate are significant to man and his environment, an essential importance of weather and climate are that they bring rain, snow and other forms of precipitation. The natural ecosystem is continuously affected by the activities of weather and climate. Consequently, places with extreme dry climate (desert environments) are best locations for mining of minerals and metals that are used for many production enterprises such as electronics. + Dechert, Sandy. "Weather And Climate — Similarities & Differences." (2014). .
+ LaRoche, Carolyn. "What Are the Similarities Between Weather & Climate?" (2017). .
+ Ramankutty, Navin and Toshichika Iizumi. "How do weather and climate influence cropping area and intensity?" Global Food Security (2015). .